Heat oil in large skillet or wok over medium-high heat. Meanwhile, squeeze sides of rice packages to separate rice. 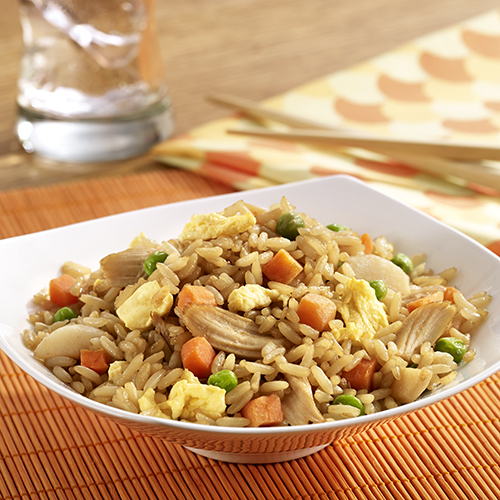 Pour into skillet; cook 7 minutes or until lightly browned, stirring occasionally to break up remaining rice. Stir in water chestnuts, chicken, peas and carrots, soy sauce and garlic powder. Cook 3 to 4 minutes more or until hot, stirring occasionally. Push rice mixture to one side of skillet. Add Egg Beaters to empty side; cook without stirring until edges and bottom begin to set. Gently turn to scramble; continue cooking until set. Stir scrambled Egg Beaters into rice mixture. I bought a medium pack of uncooked chicken tenders and cooked them in the wok with a generous portion of Teriyaki sauce. When it was thoroughly cooked, I poured the chicken and broth out into a bowl and set aside until the recipe called for it. I substituted corn for the carrots. I substituted two 10oz bags of brown rice for the white rice. I left out the water chestnuts. The results were pretty delicious and I knew this to be fact because Bobby rarely likes food and he asked for the leftovers to go in his lunch for tomorrow. Mine did not look near as pretty but it was really tasty! New recipe success!